Status: Restoration completed February 2013, relocated to its new home. This Mason & Hamlin 5'4" Ampico reproducing player baby grand came to Historic Pianos in 2009. The piano was built in 1928, shortly after the highly-regarded Mason & Hamlin factory in Boston licensed the Ampico system and began installing it in their instruments. Relatively few Mason & Hamlin Ampicos were built, and because of their rarity and quality they are in high demand. This is a Boston-built Mason & Hamlin baby grand from the period before Mason & Hamlin was acquired by the American Piano Company, after which production moved to Rochester, NY, and the perceived quality of M&H instruments began to decline. The instrument show excellent details of engineering, including the trademark Mason & Hamlin "Tension Resonator" rim stabilizer system that is generally thought to maintain excellent soundboard crown and string downbearing, which this instrument retains. The heavy laminated rim, intact soundboard and bridges, and other famously durable M&H engineering in other respects are all apparent. So it is not a surprise that the instrument has features usually only found in larger grands, such as individually tunable duplex and triplex scales, original ivory keys in good condition, sturdy action frame components, and unusually large original hammers with only modest wear. 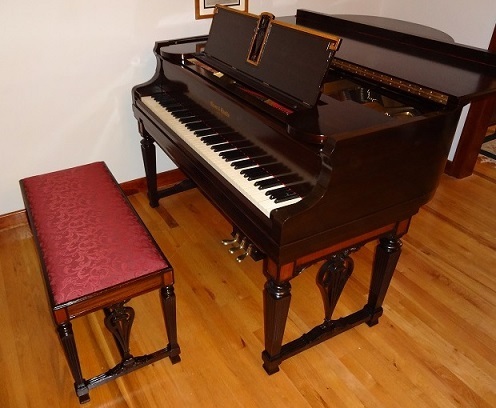 The attractive artcase design includes a case of dark mahogany, with carved Chippendale-style legs, bench, and music rack with inlay of lighter mahogany. The restored Ampico player functions to like-new specifications. The restored action is carefully rebalanced for ideal, even touch and expression. And the restored French polish shellac finish highlights the beautifully, naturally dark mahogany case with contrasting lighter mahogany and burl accents on the carved artcase legs, bench and music rest. Restoration of the instrument began in October 2012, and was completed in early 2013.